This year makes Jeff’s fifth year being a part of the Run Far program. Over the past four years, Jeff has been a member, an assistant coach, and head coach. 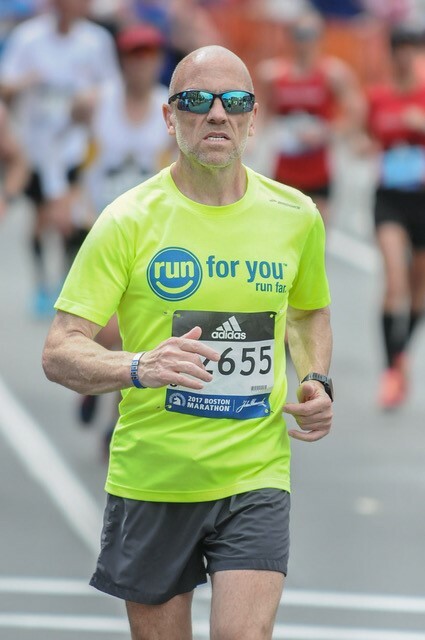 Jeff became the Midtown Program Coordinator in January of 2018 and currently still coaches the sub 8:30 pace group as well. 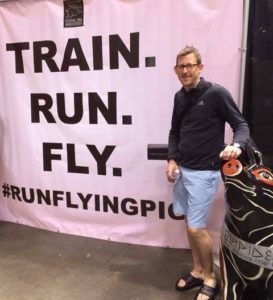 Jeff is an RRCA (Road Runners Club of America) certified distance running coach. I started running about eight years ago. I never ran before. My first running program was from a short article in a health magazine. It was probably titled “Get off the Couch and Run a 5K,” or something of that sort. I never imagined I would ever run half or full marathons. A lot has changed over the years and I have now run plenty of half’s, full’s and even a 200+ mile relay race. My training has changed too. If you have not trained in a group before, I think you will be amazed of the benefit from the group dynamic. The first year I trained with the group I cut more than 10 minutes off my half marathon time. I really enjoy seeing the improvement in my group. I have seen runners transform in the program and do some amazing things. I have a busy law practice and a busier home life. I have twin 9-year old boys and an understanding wife. I am a Cub Scout den leader and an assistant baseball and basketball coach. Time for me is in short supply. I run in the morning before I go to work. It takes a lot of discipline to go out at 5:00am. A bonus for early morning running is I get to see 200 sunrises a year. Running is my therapy; it helps moderate stress and provides a healthy recreational outlet. I am the example that you do not have to be athletically gifted to be a runner, you just have to be persistent. I look forward to running with you. Tired of open-ended or non-committal New Year Resolutions, I decided 2011 was the year to try my hand (or rather, my legs) at running and set my mind to running my first ever 5K. Six years and quite a few races later, I’m still at it! I started running with the Run Fit/Run Fast run program in 2011 and graduated into the role of Coach in 2012 at the University location of Run For Your Life. Having moved further south of Charlotte, I hung up my Coach shirt in 2015 and found myself looking for a run group closer to home. After searching far and wide, I found myself right back at Run For Your Life but a little closer to home, at the Midtown location. I particularly enjoy working with first time runners and runners new to longer distances. Having been a new runner not so long ago, I feel that I have a wealth of knowledge and experience to share. 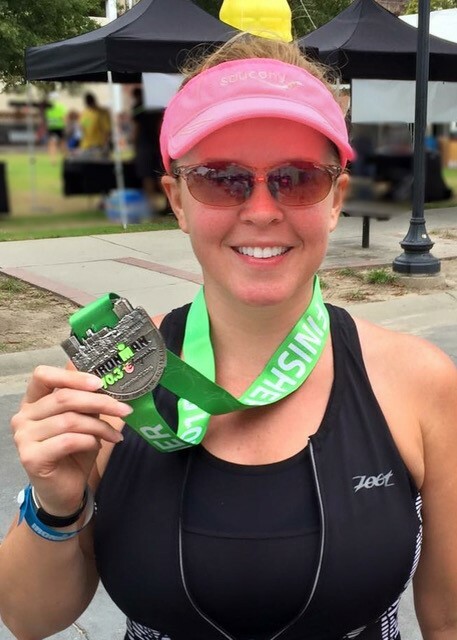 In addition to running, I am also a triathlete having completed my first triathlon in 2012 and a half ironman in 2015. I enjoy swimming, cycling and pretty much anything else that can be done outdoors – although I leave the golfing to my husband. In May of 2017, I started to set goals to get back into fitness. I found an amazing group that encouraged me to keep working out and also try new things. A lot of them were running races and I signed myself up for the annual Turkey trot in my home town of Hilton Head. 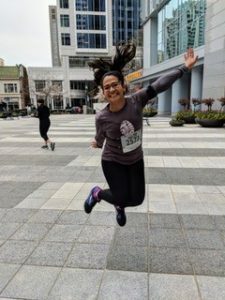 For my first 5k, I trained on my own and found that I loved it! I wanted to run more and longer races, but I also found during my training that I had developed Shin Splints. I gave myself a rest and did some PT, but I knew I just wanted to keep going. I found it hard to just train on my own, but for Christmas of 2017, my partner gave me the gift of joining Run Far. My goal then was to just run with the group and eventually find a race to run. 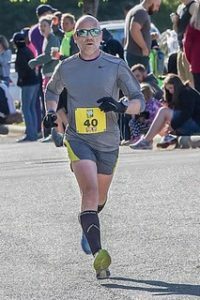 During the Winter/Spring Season 2017, I ran two 5ks and a 10K toward the end the season. One of the things I love most about running is that I can escape the chaos of life for a while. I also love racing because of how much encouragement others are always giving. I am a firm believer in that you aren’t racing someone else but yourself and on race days, I love to see that others are just saying “keep going” and “good job”. I love cheering others on to accomplish their goals and have success in their running. In the Summer of 2012, I decided to make a lifestyle change because I was overweight and out of shape. I set out on a journey to lose 40 pounds, get in shape, and never allow myself to look and feel like that again. I started by walking an hour a day, seven days a week. After a couple of months, I decide to try running a mile and it almost wiped me out. I slowly kept increasing my distance and when I was able to comfortably run 3 miles, I ran my first 5k. Over the next two years, I continued to run three to five times a week, gradually increasing my distance and speed. In the Summer of 2013, I decided to train for the Thunder Road (now Charlotte) marathon on my own and successfully completed it. In 2014, I ran a race about every two weeks on average and placed in my age division for the first time at the Greek Fest 5k. In 2015, my goal was to run the same 19 races that I ran the year before and try and place in every one of those 19 races. While I felt that I had done fairly well training on my own, I decided to join the Run Far program in the Spring on 2015 to help me reach my goal of placing in 19 out of 19 races. Because of my success in the Run Far program, my running improved and I ended up placing in 18 out 19 races in 2015. In the Fall of 2015, I decided that my next goal would be to qualify for the 2017 Boston Marathon. In March of 2016, I ran the Wrightsville Beach marathon and qualified for Boston. A month later, I ran the Kentucky Derby marathon in Louisville and qualified for Boston again. 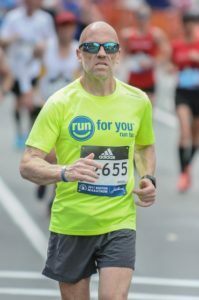 In April of 2017, I ran my first Boston Marathon. To date, I have 15 full marathons and 15 half marathons under my belt. I started coaching with Run Far in the Summer of 2016. I enjoy helping other runners reach and exceed their goals in the same way the Run Far program has allowed me to reach and exceed my goals. My running journey began 15 years ago when I made an impulsive decision to register in a lottery for a marathon. Lucky me, it was the first lottery of any sort that I had won in my life. Six long months later, after breaking in my first pair of running shoes, discovering chafing and blisters, learning about electrolytes, and logging miles and miles of run-walk training, I accomplished a full marathon and experienced the indescribable joy of accomplishment. Years later, I proudly classify myself as “a runner” and I am grateful that running is part of my life. Running fuels me with positive energy, and helps me stay centered when I allow my plate to get too full. A fellow running mate often reminds me “80% of life is just showing up” and I subscribe to that. Belonging to the Run Far group has greatly influenced my commitment to prioritize exercise and a healthy lifestyle and I’m so happy to be part of it. When I moved to Charlotte in 2014, I volunteered at the mile 16 water station of Thunder Road Marathon (now Charlotte Marathon). After seeing the runners and feeling the excitement of race day, I knew that I wanted to complete a marathon. I remember going for a run after volunteering and then researching training programs in the Charlotte area. I joined the Run Far program in January of 2015 and completed my first full in March of 2015. I’ve continued to train with Run Far and could talk about running and races and trail running and ultras all day long! Running has brought so much happiness to my life that I want to share that joy with others. My first race of any sort was a triathlon in 2009. It was great, I loved it , but I did not continue. In 2014 I ran my first 5K as a support to my husband on his weight loss journey. I liked it so much I set goal to run at least one 5K per month in 2015. This was my way to help keep me consistent. I continued my journey in 2016 completing several 5K’s and 4 milers, two 8K’s , two 10K’s, one 15K and 4 half marathons. 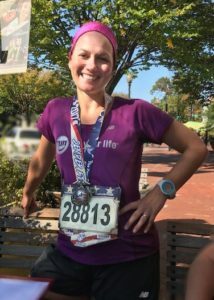 In 2017, I set a goal to complete a marathon and began training with Run Far. I accomplished my goal in November of that same year. Running not only helps me stay fit, it also helps me release stress and keeps me energized. 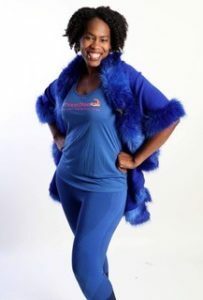 I am a natural encourager and I fully believe in the saying “Your race, your pace.” My new lifestyle has encouraged friends, family and co-workers to embark upon a lifestyle change as well. When I am not running or training, I love to write (I’ve written 3 books including one about surviving in the public school system), speaking on educational concerns, encouraging fellow educators, singing and dancing liturgically. I encourage you to get fit, but never quit! I joined the Run Far training program (called USA Fit at the time) in 2008 at the age of 41 to train for my first marathon. My oldest son was 9 years old at the time, and as I walked up the 2 flights of stairs to my office one morning, I was out of breath and it struck me that I hadn’t really exercised very much since my son was born, certainly not consistently. I decided to run a marathon that year because I wanted to do something that was challenging enough that I couldn’t fake my way through the training. I was pretty active for most of my life and was always able to pick up and go run 5 miles, even after months of no training. But my experience running a half marathon in 2001 taught me that the marathon and half marathon distance is no joke. I joined the Run Far program because I didn’t really know how to train for a marathon, and I knew that I wouldn’t stick to a training program on my own. I wanted and needed the accountability that comes from telling other people that you will meet them for a run. The group of people I ran with that year, and the almost 10 years since have been much more than that. Not only did I have great coaches helping me through my initial struggles with getting back in shape, but I have met great friends who not only helped to hold me accountable to my goals, but also supported me on the bad run days and cheered me on when I crossed the finish lines. I ran a 3:31 in my first marathon that year and was hooked. I started as an assistant coach with the program the following year and was a head coach for a few years after that. 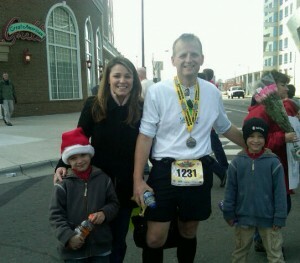 Since running my first marathon in Charlotte, I have completed 11 marathons in total. I ran a 3:17 PR in 2011 and achieved my goal of qualifying for the 2012 Boston Marathon. I’m excited to be coaching with the Run Far program and look forward to seeing you out on the roads of Charlotte. I was never a runner or had any interest until I reached the age of 60. As with many others of a certain age I had become overweight and basically out of shape. 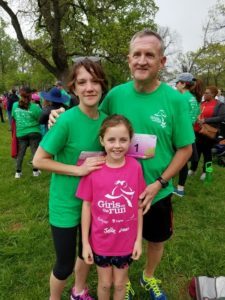 My daughter encouraged me to diet and train for a 5k which I did. I successfully completed that 5k and said I would never do anything longer. Next thing you know I had been talked into a 10k and then a half marathon. I had become hooked on running. I retired in 2012 and made one of my better life decisions in joining the RunFar group to train for a marathon. While my time was not great I did complete it. The next year I was asked to help lead one of the pace groups in training. I was not sure about doing this but agreed. I started those duties in 2013. I believe I have received much more inspiration and encouragement from those in my group than I could have possibly given out myself. With the group’s encouragement I have ran numerous half marathons and six marathons. I particularly enjoy the chance to mentor those training for their first half or full marathon. I consider myself a social runner. Getting to know fellow runners and making new friends is my favorite part of the program. I first started running as a way to stay active during my senior year of college in 2010. 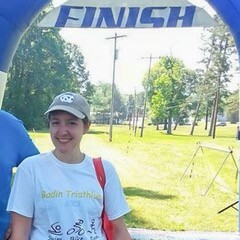 After I graduated, I started participating in races, mostly 5Ks. I did not even consider running long distance until December of 2017. I made a new year’s resolution to start running again after falling away from it. My goal was to train for the Charlotte Half-Marathon by signing up for Run Far’s 2018 Winter/Spring and Summer/Fall programs. By the end of the program in April, I was ready to enter the RaceFest Half-Marathon. Finishing my first half-marathon led me to a conclusion I never thought I would reach: I wanted to run a marathon. As a result, I signed up for the 2018 Charlotte Marathon and used the Run Far Summer/Fall season to train for it. The encouragement and training I received from my coaches in the program (shout out to Katie, Kim, Holly and Ron) helped me over the finish line to achieve a feat I never thought I would overcome. 2019 will be my first year as a coach and I really look forward to helping other runners achieve their race goals! Outside of running, I am active in the community as Vice President of the Plaza Shamrock Neighborhood Association and as a volunteer for different local political campaigns. I really enjoy reading, listening to music and writing. I got my first taste of running in high school, when I joined the cross country team as a way to fill the afternoons while my brother was at football practice. Most of our trail was in the woods and I quickly fell in love with the beauty of running through the trees and the illusion of briefly leaving the world behind. After numerous false restarts in college and my 20’s, I finally picked it back up shortly before my 30th birthday after moving into a house in downtown Chapel Hill, NC. Starting with a walk in my new neighborhood, it wasn’t long until those walks became walk/runs and then runs to any part of the town I decided to try and reach. 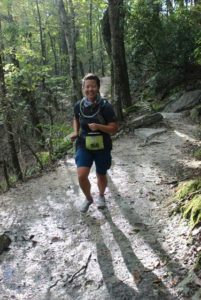 I first started training with the local running store in Carrboro to train for a 10 mile race, followed shortly after with training for my first half marathon and then mentoring new runners to the group. When I moved back to Charlotte a few years ago, I knew one of the first things I wanted to do was find a group to train with here and I feel so fortunate to have found Run Far. I love that running gives me the opportunity to walk out my door and end up in a completely different part of town on the energy of my two feet. I also love meeting new runners and joining them on their journey. Training for a race, especially a long distance one is always scary in the beginning. Then you start adding on the miles and discover you will survive each week’s long run and you find yourself reaching the finish line on race day and grabbing that well-deserved finisher’s medal.